I absolutely love cars since I can remember. My mom told me to get other interests too, because she said I would bore people if that was the only topic I could talk about. Then she changed her mind and told me to look for a career involving cars, seeing that it is my passion and that she wants me to do something that makes me happy to go to work one day. So, I started thinking and one morning, when I was about 11, I told her that I was 51% sure that I would want to become a motoring journalist. Lately I am rethinking my choice, but I would still love to do something involving cars – if it is full time or just as a hobby. Here are a few thoughts about becoming a motoring journalist. They crash cars for fun and sometimes do very thorough road tests – involving stupid questions, like: Can you fit an eel next to very reactive sodium cubes in the bookt of a KIA? Or Can you fit Cienna miller into the glove compartment of a Skoda? Yes, I know. They – or rather Jeremy – also gets in trouble a lot for saying what he thinks, without thinking about the repercussions and then get fined. But all in all, they are the most entertaining lot in the motoring world today. Fortunately or unfortunately, not every motoring journalist will end up being a TV celebrity. So, for the rest there is the less glamorous, but still very satisfying option of the printed media. There are hundreds of car publications to work for all over the world. A few examples are car and Driver, Top Gear Magazine, Top Car, Car, Rides, Classic Car etc. Here you see only a few examples of car magazines from different countries. Another option in motoring journalism is blogging. There are many blogs available on the Internet. These few sites are a good start: www.carmagblog.co.za, www.carblog.co.za, www.celebritycarsblog.com. What skills do you need to become a motoring journalist? o A love of cars and/or motorbikes and/or other vehicles is a necessity. o Secondly you must have a wide and in depth knowledge of the subject. o And of course, it would help if you can write. Study journalism at a local university or internationally at a school of journalism. Find work in the industry at either a newspaper or a magazine and then work your way up – who knows, maybe you will take over Jeremy Clarkson’s job one day when the BBC finally decides to kick him out! LOL! Read articles in motoring blogs and magazines to increase your knowledge and to learn how articles are written. 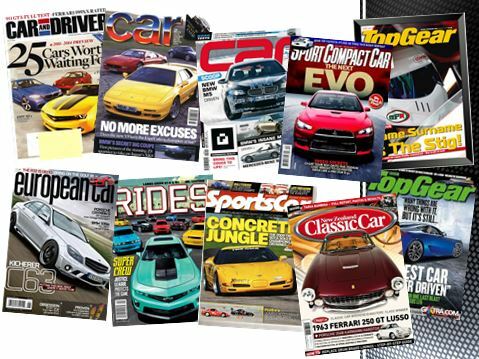 Read as many different magazines as possible to get different journalists’ views on different aspects of motoring. Improve your writing skills by doing courses, writing regularly (or join my mom’s Writing Club). Visit car shows or expo’s whenever you can. Start you own blog. This will help you write regularly and it will also help you to get your name and views out there. This will also count in your favour when you apply for university.